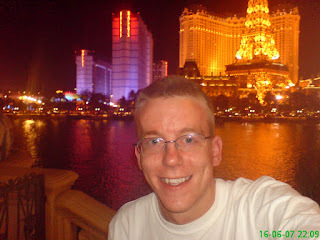 James Atkin's Poker Blog Bellagio Las Vegas Rio WSOP Las Vegas Day Three - Another marathon session spells success! Las Vegas Day Three - Another marathon session spells success! My body-clock is all messed up from the random poker schedule, and I found myself awake at 5am today. I took advantage of this by getting an early breakfast on the strip and spent the morning around the pool at the Monte Carlo. I was torn between playing the $500 Freezeout at the Venetian and the WSOP $1.5k, as I was not too thrilled with the concept of a 3k starting stack. Mr Sherwood rang me 45 mins before the Rio event started and told me to get my arse down there, so I went with the WSOP event. We actually ended up being at neighbouring tables, and was there to hear Rob hit a one-outer with 99 all in on KJ29 to find he was up against Kings and hitting the case 9! Crazy! I managed to build up to 6k in the first level. In one hand, having led the flop, made a good call down with bottom set with straights and flushes appearing all over the place (I had 44 on 4a 5c 7c Jc 9h). However I was down to 3k by the first break and was voicing my displeasure with my play to Barcelona buddies Rob Sherwood and Heads Up champ Jeff Kimbler. In one pot a a tight player with only 850 chips raised to 300, the hijack called and I called in the big blind with 83s. The flop came down AT8 rainbow. The raiser went all in, the hijack passed, and I figured I had enough pot odds to hit what I assumed was a 5 outer here, so I called telling him he was miles ahead, although his AT seemed more like light-years ahead and held up. I also lost some chips making a late position raise with J5s, only for the big blind to min-raise me. I call but miss the flop completely. There was no-need to raise such junk at this early stage! Anyway, after the break I picked up QT in the small blind in a limped pot. It came down QJ8 with 2 clubs and I checked ready to raise. It checked round and the turn was the 6h. I bet out, and the big blind called. The river was the Td. I checked it and the big blind bet out. I say "that's a pretty sick river card unless you have 9T" and make the obligatory call, since it didn't make a whole load of sense for him to have a straight. He flipped 8c 9c which made some sense of it. So I was down to 1500 chips and ended up shoving 66 to a mid-position raiser, who held JJ and the Jacks held up. I went back to the hotel and had another hour round the pool. I then went to check out the cash-table scene at the Bellagio. I whack myself on the list for some $30/60 limit poker. I played for about an hour and ended up a pretty impressive $1200 up. Although I had no big cards, I had a great run with suited connectors, and was getting paid off left right and centre. It came round to 8pm and I decided to put my profit into the $1k nightly tournament where I'd chopped for 2nd two nights previously. I flopped a set with AA on the first level but made at most 300 chips out of it. I managed to take an almost doubled up stack to my second table, a proportion of which was made when I bet out on a 4 flush completed board with the Qh (2nd nuts as one of the hearts was a King), was called in one place and a player I had down as a joker raised it up. I made the call and was good. I was playing my 2nd table pretty well and built up to 12k with small pots. Then, a limp under the gun and I woke up with Aces. I raised it up and the big blind moved all in for a large over-bet. It took me a couple of seconds to call only as I was trying to comprehend the situation, and I shoved all my chips in as fast as I could. I flipped over the Aces and heard his disgust as he flipped over KK. The Aces held up and I had a nice stack. A couple of rounds later there was an under-the-gun raise and I had TT in the big blind. The guy had too many chips to raise here when I had him for a strong hand, but I didn't think I could open pass here with chips in the pot so I called to see what the flop looked like. T92 rainbow, I hadn't expected it to be that good. I checked it, he moved all in and of course I insta called. He had QQ and again I held up. I was running good! Although I had this flourish I went card dry for a couple of hours. My turn and river bluffs got picked off by A2 when trying to represent the Ace on 998A7. Having been way above average I was now about average. At 300/600 a mid-position raiser was called in 1 spot and I had 2c 4c in the big blind and decided to call. It came down JT6 with two clubs. I moved all in for 12,000 chips on the flop on a semi-bluff hoping to take it down. The raiser made a (good?) call with KJ off but a club hit the turn, though it was the Kc to make it interesting. I doubled up. I then lost a fair amount on a another river bluff to get called by 2nd pair. And again I doubled up on a huge semi-bluff with Ac 9c. I raised in late position to get called by the big blind. It came JT2 with one club, check check. The 7c hit the river and he bet into me. I moved all in for 11k more. He somehow made the call with Ah Td but again I hit my flush and doubled up. Must be my lucky day! It soon got down to 18 players, and similar to 2 nights previously I was hovering just below average for much of the time, picking up pots here and there when opportunities arose, and managed to knock a short stack out and almost double up with pocket eights after he moved all-in with AT off. I managed to make it onto the final table, but when I was forced to lay down AJ to an all-in reraise I was down to half-average with 9 players left. With the blinds at 1500/3000 (500) the final table was basically an all-in fest. I managed to double up with a Qd 8d shove vs AT, but for the rest of this level was more of a spectator than anything, getting dealt rags every hand. The blinds went up to 2000/4000 (1000) and I made a call on the button for all my 40,000 chips with 55 when the hijack moved all in. He showed J5 and I managed to hold up to leave him with 1, $1000 chip. He went on a sick run and got back to 50,000! In the process there were a couple of 3 way-all ins which knocked the table down to 7 players. I was only able to move all-in once at this blind level with everyone else moving all in before me. I managed to re-shove with AQ after the chip-leader raised it up to keep me in the game around the average mark. The guy that had built up from one chip then got caught out as the big blind made a good call with A6 vs his A2 and hit a 6. With the blinds at 3000/6000 (1000), and at 6.30am, us remaining 6 players discussed a deal. Everybody was between the 80,000-130,000 chip mark and it was decided to do what was basically an even chop. The two largest stacks took $18,200 (one of which was ironically David Gross who took the trophy two nights previousy, this time he was given 2nd place), the three medium stacks took $17000 and as the shortest stack I was happy to take $16,000. So I've benefited from two great deals over the last three days and I'm "2 for 2" in final table appearances at the Bellagio. This time I'd only had to remain awake for 26 hours straight(!) I'll have to see what time I wake up tommorow to see what I'm going to play as I would imagine the midday $1k tourney at the Venitian is a write-off after another marathon session! 0 Comment to "Las Vegas Day Three - Another marathon session spells success!"